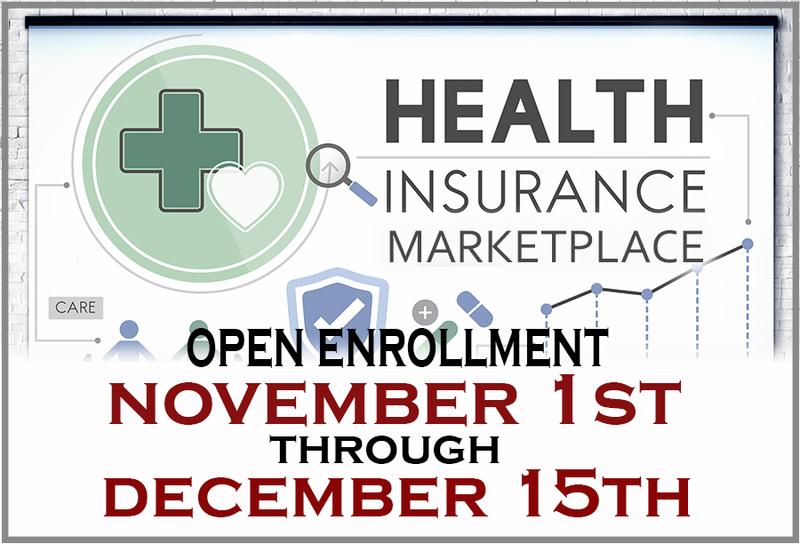 Beginning on November 1, 2018, individuals (including their families) may apply for new health insurance or switch to a different health-care plan through a Health Insurance Marketplace under the Affordable Care Act (ACA). The open enrollment period for 2019 health coverage ends on December 15, 2018. Individuals can use Health Insurance Marketplaces to compare health plans for benefits and prices and to select a plan that fits their needs. Individuals have until December 15, 2018, to enroll in or change plans for new coverage to start January 1, 2019. For those who fail to meet the December 15 deadline, the only way to enroll in a Marketplace health plan is by qualifying for a special enrollment period following certain life events that involve a change in family status (for example, marriage or birth of a child) or loss of other health coverage. While the ACA (commonly referred to as Obamacare) has not been repealed or replaced, there have been changes to the law. The biggest change is the repeal of the tax penalty for failure to have qualifying health insurance. While the individual mandate requiring that most people have minimum essential health insurance coverage (unless an exception applies) still exists, the tax penalty for failure to have insurance has been repealed, effective January 1, 2019. In addition, states have additional flexibility in how they select their Essential Health Benefits. In effect, states may elect to sell short-term health insurance policies with coverage terms of up to one year. These plans may offer fewer benefits compared with the 10 Essential Health Benefits covered under the ACA. Those living in hurricane-affected areas in 2018 may apply for a special enrollment period, which provides extra time to apply for health insurance through the Marketplace. Affected areas are those designated by the Federal Emergency Management Agency (FEMA) as eligible to receive “individual assistance” or “public assistance.” So far, several counties in Georgia, Florida, South Carolina, and North Carolina have been designated eligible for federal assistance. The federal government no longer runs SHOP Marketplaces for small businesses. As an alternative, small business employers may be able to contact insurance companies directly or work with a broker who is certified to sell SHOP policies. NOTE: If you don't apply for health insurance during the open enrollment period – and don't qualify for special enrollment (presuming you don't have access to employer-provided health insurance) – your options are generally limited to purchasing private, commercial insurance; short-term health insurance; Medicaid; or the Children's Health Insurance Program (CHIP).If you don't apply for health insurance during the open enrollment period – and don't qualify for special enrollment (presuming you don't have access to employer-provided health insurance) – your options are generally limited to purchasing private, commercial insurance; short-term health insurance; Medicaid; or the Children's Health Insurance Program (CHIP). This information was prepared by Broadridge Investor Communication Solutions, Inc. and has been made available for Voya Financial Advisors' representatives for distribution to the public for educational information only. Broadridge Investor Communication Solutions, Inc. is not affiliated with nor controlled by Voya Financial Advisors. The opinions/views expressed within are that of Broadridge Investor Communication Solutions, Inc. and do not necessarily reflect those of Voya Financial Advisors or its representatives. In addition, they are not intended to provide specific advice or recommendations for any individual. Neither Voya Financial Advisors nor its representatives provide tax or legal advice. You should consult with your financial professional, attorney, accountant or tax advisor regarding your individual situation prior to making any investment decisions. We are registered to sell Securities in AZ,CA,CO,FL,GA,ID,IL,MD,MI,MT,NC,NM,NV,OR,PA,TX,VA,WA. Investment advisor representative and registered representative of, and securities and investment advisory services offered through Voya Financial Advisors, Member SIPC.